If you live where there are deciduous forests, you know that moment. The leaves begin to trickle down, along with acorns and twigs. No matter if you pick up every stick, you turn around and there are ten more in its place. Most everything is still green, though, with just a few leaves that have already turned red or yellow. I caught the above scene at just such a time. This is Bernadine Richard's eight acre woodland garden around a 1929 stone house. Despite her first name, Bernadine is not French, although she is married to a Frenchman. She actually grew up on a farm in Pennsylvania surrounded by apple and peach orchards. "I've been gardening all my life" she explained. "Both my grandmothers were gardeners. My mother's mother grew up in England, so it's in my genes." Bernadine is also a go-getter. Her father died suddenly when she was 28. She drove his three school bus routes, organized other drivers' schedules and oversaw bus maintenance. This same take charge attitude is evident in her garden. She's definitely gone out on a limb, carving out paths and trails and creating allees (and even a maze) and making the most of the up and down topography. Her garden is always in flux, and she's constantly planting new areas on the mostly shaded property. Bernadine has gardened in a lot of different places, and she admits it took her a while to learn what would grow under a canopy of tall trees in Zone 7B. 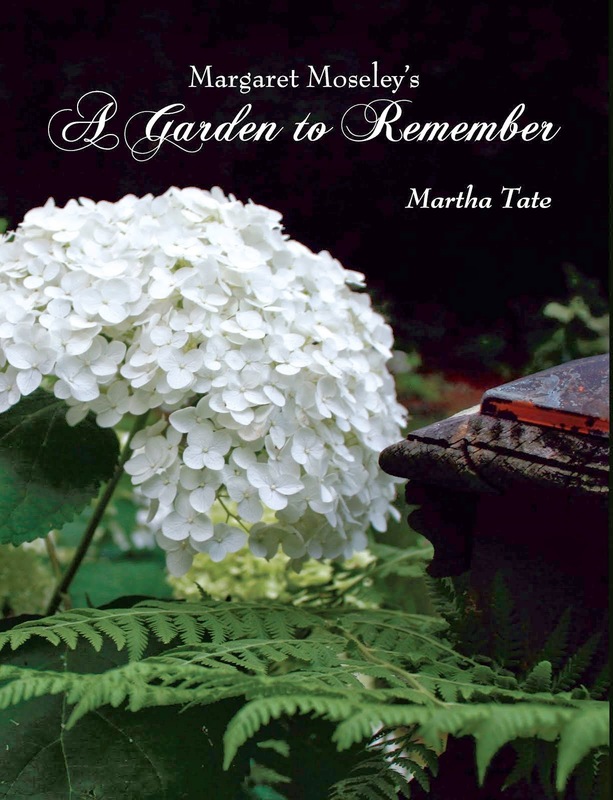 She started off in Connecticut, then moved to Long Island Sound, where she had a one acre garden. "It was very different because it was on the sea," she says. She's also gardened in Buffalo, England and Memphis, three places with very disparate climates. 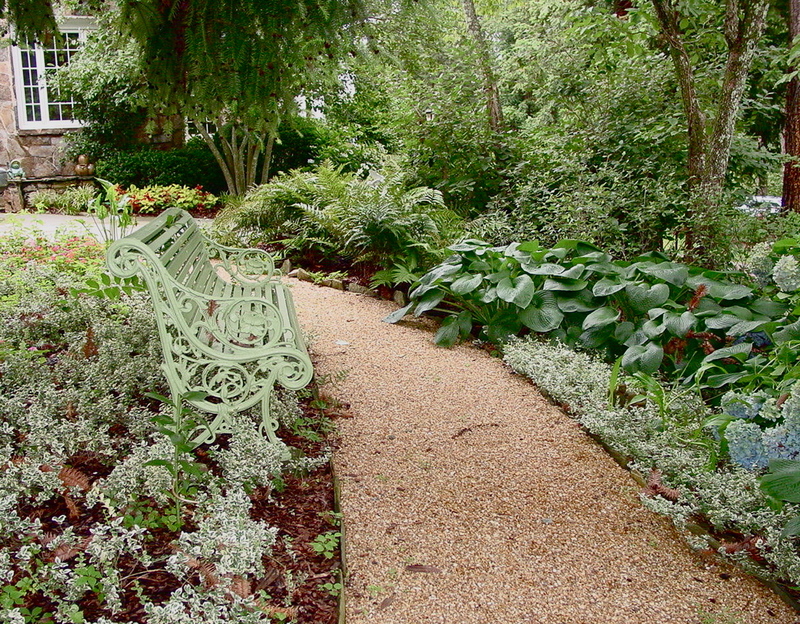 I love the color of the bench in this photograph and the way the ferns, hostas and hydrangeas ebb and flow along the gravel path. Bernadine has planned every inch of this expansive garden herself, often incorporating unorthodox elements (like painting the posts in her astilbe garden a bright red) that elicit smiles from visitors. It's a highly unusual garden where something interesting is always going on, even at the moments when the seasons are just beginning to change.